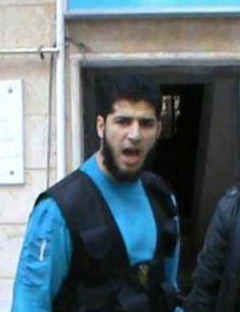 Abdul Razzaq Tlass/Talas (Arabic: عبد الرزاق طلاس), allegedly killed in February 2013, was a young officer (Lt. Colonel?) in the Free Syrian Army. After defecting from the Syrian Arab Army in 2012 at age 25, he headed the "Farouk Brigade" in ar-Rastan, a rebel hotbed between Homs and Hama. Reportedly involved in crimes from masturbating on video and blaming others, to massacring families in neighboring Al-Houla and blaming others, Tlass was reportedly killed in fighting in Homs, on February 7, 2013. Abdul Razzaq is reportedly a cousin of high-level defector Manaf Tlass - former Brigadier General of the Syrian Republican Guard, self-described Assad confidante, and also from Rastan. (all per Wikipedia) He landed in France and started in mid-July to urge regime change, based on the growing furor over the Houla Massacre his cousin allegedly helped orchestrate. This page is an explanation-free stub for now. See the discussion page for more detail. This page was last edited on 6 May 2013, at 09:31.